The deal of the week is the Virgin Mobile Samsung Galaxy Victory 4G LTE Android phone on sale for $199.99 at Radio Shack. But it gets better, Radio Shack stores will take an extra $50 off the price of the Galaxy Victory if you trade in any working phone making the effective price $149.99. The regular price is $249.99. The $50 trade in credit is only available at Radio Stores, not online. If you don't have a phone to trade in, the Galaxy Victory is also on sale for $199.99 on the Virgin Mobile website. In addition to LTE, the Galaxy Victory has a 4 inch 800 x 480 px screen, 5.0 Megapixel camera with auto focus, LED flash, dedicated camera button and 720p video recording, 1.3 Megapixel front facing camera for video calls and a dual-core 1.2 GHz processor. The OS is Android 4.1 (Jelly Bean). Free $20 Google Play Store Credit with any Android phone purchase (ends 6/30). T-Mobile Samsung Galaxy S II Android phone $219.95 with free car charger and gel skin (reg $299.99) Free shipping. NET10 (online only) Free overnihjt shipping on orders of $19.99 or more through 6/28. Not all phones are available in all areas. 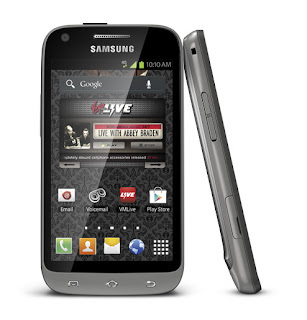 Virgin Mobile Samsung Galaxy Victory 4G LTE Android phone $199.99 (reg $249.99). Plus. in stores only, get a $50 guaranteed trade-in credit for any working phone when you purchase the Victory. Straight Talk (online only) Free overnight shipping on phones $29.99 or higher through 6/28. Not all phones available in all markets. Free Motorola W418G flip phone LG 620G slide with purchase of a $30 All You Need refill. Free LG 620G slider or Motorola W418G flip phone or Samsung T528G touchscreen with purchase of $60 International Unlimited refill. Samsung Galaxy Centura (Verizon) Android phone $99.99 with free $15 Gift Card. TracFone (online only) Free overnight shipping on orders of $19.99 or more through 6/28. Not all phones available in all markets. LG 800G touchscreen $29.99 with free $19.99 refill. I wonder how those poor sales people at T-Mobile stores trying to explain to customers why their prepaid phones are double the price of the same phones on HSN, I hope they don't work on commission, just straight salary, otherwise they be starving to death. The sales on HSN are one-off type of events, i.e. it may be limited in quality, what you see is what you get, etc. What I am saying is you need to be an opportunistic shopper and be prepared to jump on the opportunity when it comes to these special deals. Right. And that kind of bargain-hunting shopper is not going to go to a Tmobile store to buy their cellphone. No need to pity the Tmobile sales people. They are trained how to sell to customers, and how to handle the bargain-hunters. HSN has the Samsung Exhibit for Tmobile for $130 today. The Galaxy SII is now $220.